Summer is when I like to break out the glitter top coats. Who am I kidding? I always like to break out glitter top coats! Seriously though, I find in spring I do more creme manis, and by time summer rolls around I'm all about glitter. I have pretty glitter part of the new Sally Hansen Triple Shine line to share with you today. 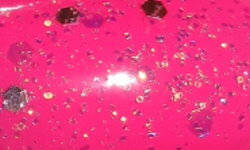 Twinkled Pink is a sheer pink base with gold iridescent glitters, silver glitters, and iridescent microglitters. Color: This is a gorgeous color combination of glitters. This looks like a sunset in a bottle to me! I love the combination of the iridescent gold with the silver. I don't have glitter topper like this. Formula: I used 2 coats over a base here. The formula was smooth and easy to apply, but I so wish this glitter packed more of a punch. This is very pretty, but a slightly more dense glitter would of been better. Price: I paid around $4-$5 for this at Walgreens. Overall: This is beautiful combination of glitters, that adds a really extra sparkly touch to your nails. The glitter could a little bit denser for me, but I still really like this one. The glitter is pretty, but mostly this has made me want to go home and slap on some neon pink! LOVE that China Glaze! Very pretty! I bet you like glitter in the summer better because the sun is out and it is oh so sparkly!